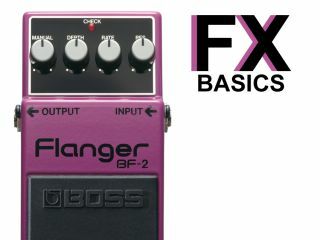 Guitar FX basics: What is a flanger? Flanger is a colourful effect. Here's one in purple. Click here for all Guitar FX basics videos. Getting to grips with guitar effects can be a complicated business and there are so many different types that it can be difficult to know where to start. This Guitar FX basics series of video lessons is a brief introduction to the most common effects. This video lesson focuses on the flanger. A flanger works by mixing a copy of the guitar signal with the original after delaying the copy signal for a few fractions of a second, causing a ‘phase shift´ between the two signals. The length of this pause is gradually varied over time, resulting in a ‘sweeping´ effect. Watch the video below to hear how this sounds. A flanger is similar to a phaser, although the audio filter that the signal is passed through on a flanger is slightly different, resulting in a different sound. Take a look at our Guitar FX basics video lesson on the phaser to hear the difference.